Bits and Pieces...: Zva Blog Hop! you will take some time to join us for a little bit of fun! you can along the way. chances you will have to be one of the lucky winners. So, withough further ado, here is my page. I am absolutely SICK of winter. We have had more snow and snow days than I care to count. And, as I mentioned before, I no longer get off for snow days. So it just basically STRESSES me out big time to figure out how I'm going to work, who's watching the little guy, etc., etc. Anyway, I thought I'd document my feelings by creating this page. The journaling says: Dreamin' of Summer...of the beach, Woodside Farm ice cream, bonfires, playing outside late, BBQs, Slip n Slides, Rita's, the ice cream truck, fresh produce, flowers, fireflies, the pool, the heat! After 40" of snow this winter, we've EARNED it! The papers are all from Webster's new Seaside Serenade line. I'm in love with it!!! And the stamp, screen, Glimmer Mist, chipboard and Glimmer Glass are Tattered Angels. Another product I love is this pearl flourish set. (PE02CB127) I love the fact that the pack comes with two different flourishes. White is a great color to work with. I often use my Copics or Sharpie pens to color them in order to coordinate with my papers. Two new products from the newest release are my favorites, too. I LOVE the new corner flourishes and ALL of the red crystals. The red is so deep and elegant and I know I'll be able to use them on lots of projects. They will be available soon. I know that Emma's will be carrying them as will Scrapbook.com. You've seen this layout before, but I'm sharing it again to point out my favorite crystals! So, that's it for today! If you started at Kim's blog, then you're done! If not, head on over to her blog so you'll be sure to see all of the awesome projects the team has done! Gorgeous layout! Thanks for showing the product packaging - it makes it easier to know what goodies you are using!! What a fantabulous lo!! wow!! Ooo! I'm dreaming of summer, too! Love the Glimmer Mist! What a cute idea! Your layout really does look like a dream. Wonderful interpretation! This is so freakin' cool:) Love your use of the Webster's papers and ZVA pearls. 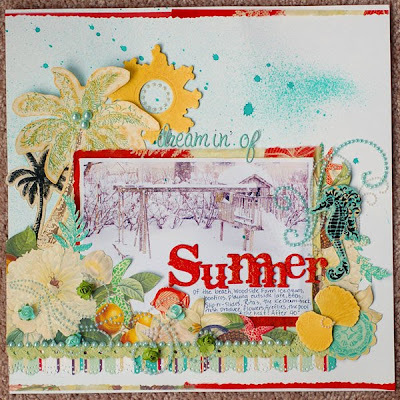 Your "Dreaming of summer" layout is awesome! I love your color choices. Wow you can feel the summer here. Lovely! What a neat layout-I love your use of the flourish and thanks for showing some of your other favorites-I just love ZVA!! Very interesting scrapbook page. I really like it. The summer layout has got to be my favorite project on the hop so far. The image, the colors, the embellies, It's OUTTA THIS WORLD!!! :) your page made me smile in a big way.. We have the same kind of weather here to so i long for summer to! Gorgeous detailed work as always! What a fabulous layout! LOVE it! I'm too intimidated to even try a layout for now, so sticking to just cards! I can sure see how having lots of ZVA product would definitely help though! Love your sense of humor ! Zva does have very nice products. They look beautiful on your LO! Absolutely stunning Annabelle! I love everything you create. I'm dreaming of summer here too! Love how you combined the WPages with teh Zva. Pretty layout...I'm so ready for summer too...bring it on! This is one fabulous page. I just love all the details and bling on this page. Wow! This hop went by so fast. All the DT were amazing. This is the way to start of the 1st day of the month. Such a fun layout Anabelle! I just love those flourishes..they have fabulous shape to them! Gorgeous!!! And I had to crack up at the winter photo with the Summer feel! What a cute idea for a page! stunning, stunning, stunning!! love what you've done here Anabelle!! hugs!! I LOVE your LO! Goal accomplished. I totally saw the waves in the pearl swirls. Gorgeous! Very pretty layout, love all the details! My goodness...so many fun things to look at on that layout! Love it! what a great layout.I'm dreaming of summer. But the weather here is Bad. Raining. 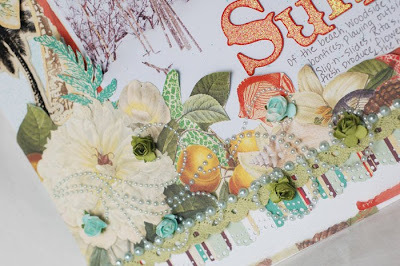 aahh ... the pearls of summer - gorgeous layout! Wow a those details! Wonderfull! how cute! i would have never thought to put beach stuff on a winter photo but wow - what a neat idea! i'm dreamin of summer too! Very Festive. Love the glimmer mist, glimmer glass and pearls. God bless! O wow, such an inspirational layout, love what you've come up with! Great job, hugs, Wendy. beautiful! I love the red swirl! Anabelle, your page is gorgeous....as always. I love your style. Great use of Zva goodies. We too had LOTS of snow this winter. It's has been 30 years ago since we had this much. Fortunately it's getting a bit warmer now. Hopefully spring arrives soon. this layout is so cute ! didn't know about the borders but i am sure going to look where i can buy them ! This is a beautiful layout. Love all that you did to it. I am so ready for summer, I think that I need to do a layout like this. Zva products and websters pages: a perfect match! Thnx for showing it to us! I absolutely agree with your page and love the great summer feel to it! WONDERFUL job!! Beautiful LO! Love all the details. Great layout, I want summer too! Great layouts. Love the Glimmer Mist and the use of the pearls and bling. Thanks for sharing. 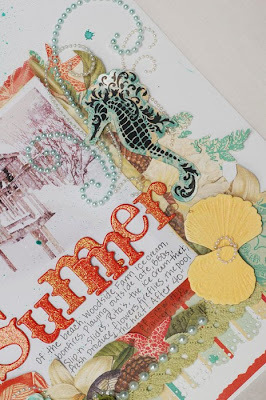 Wow what a gorgeous summer layout, the shimmering you used is awesome, love the sea horse and wow, I just love it all, so many gorgeous Zva products here. Just love your layouts, follow them in the mags, you are very talented. Beautiful pages. I love the embellishments. I could almost feel the breezes as the flourishes helped make the dream seem more real ;) Excellent job, great use of flourish and bling, and extra credit for inspirational narration! Such a cute summer card! I love it! I'm so inspired by the pages I'm seeing here and other blogs. Thanks. Just LOVED this page (didn't I see this for a brief moment yesterday. ;) ) Anyway - you rawk the Zva! What an awesome layout!!! I'm dreaming of summer too! So much going on here! Great job!! Stunning and gorgeous! I could look at your creations all day! Beautiful page. Love all the flourishes--really adds dimension to the page. Absolutely Gorgeous cards, Love the Zva Flourishes. I'm dreamin of SUMMER as well :-) Thanks for sharing. gorgeous layout! loved the juxtaposition of the snowy photo and the summer elements! beautiful lo!! I can almost feel the sun! Stunning layout love all the pretty details and gorgeous colours. And I SO know how you feel!!! I feel the same way, I can't wait 'till it's summer! The blue and lime colors are awesome, thanks for sharing! Love, love this LO! So many details! I will love to see on person. Beautiful pages...the Summer layout is fab as are your little angels....I love the winter pic with all the summery wishes...the sun first looked like a clock...ticking away the time til warmer weather...lovely! Great layout and I'm ready for the beach too! Love all the extras you included. My list lengthens again. waiting for summer here too! 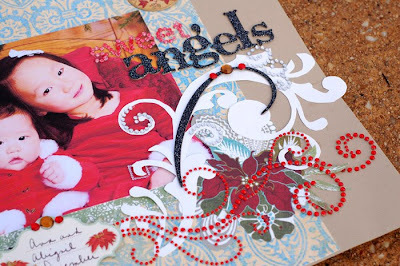 great page...love the pearl flourishes and the pearl strips--so versatile! Your designs are just awesome! Love the Zva! Your layout makes me long for summer!!! It's been such a lomg winter!! Love the flourishes and the pearl strings! Great job. Like the bright colors. 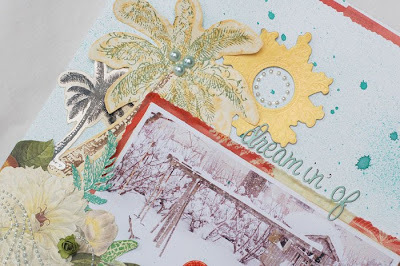 I love the dreaming of summer layout. All those embellishments are fabulous. Such a beautiful layout! I love the colors and I love the pearl bling! I love your layout! I like the way you stacked your "m"s in Summer. Thanks for the chance to win some sweet Zva products! Great layout. I love the flourishes too. Wonderful layout, I feel the same way! Bookmarking it! Your layouts are awesome. I love the red swirls. Ooooh, this is SO pretty! Totally unexpected photo after seeing all the bright, summery colors on your layout lol! what a bright way to get through the winter! faantastic! these are incredibly pretty! And I love those blue & lime pearls too- as well as EVERY flourish zva makes! lovely layout and great color palette! we're all ready for spring - except march came in like a lamb here - oh no!! I'm sick of winter too! Nice layout! I'm ready for summer too! Love the Zva products. OMG, anabelle, great minds think alike! I just started a page with the same theme and almost exact same title (except mine is 'dreaming of spring' lol) - must be b/c we both got stuck with insane amounts of snow!! LOVE your gorgeous page and those beautiful crystals! I really love this and so agree with your feelings about winter. Hope you don't mind if I make it my desktop for a while-it will certainly brighten my spirits. Dreaming of summer myself. Love this layout .. so beautifully done! Love your layout! The flourishes are my favorite. Beautiful! Pretty LO, sorry to hear you have to work even on snow days! Ouch! Love ZVA!! Wonderful layout. I like the bling and the seahorse. Your layout is perfect. I am also sick of winter and your page lifted my spirits. Great Job!